Why are Israelis so moved by the image of a dead Syrian refugee, but oblivious to the plight of a slain Palestinian child? Two photographs. In the first a face buried in the sand, a tiny body dressed in rags, his bare feet askew, dried blood on one of them. In the other, face buried in the sand, feet in small shoes resting next to each other, the tiny body awash in water. They are almost the same age and the similarity between them is amazing and shocking. Ismail Bahar, in the first picture, Aylan Kurdi in the other. Two dead toddlers, lying on the seashore, separated by a year and a few months and a few hundred kilometers. The first photograph appeared all over the world and was concealed in Israel. That compassionate newspaper, Yedioth Ahronoth, did not publish it on its front page and did not caption it “the toddler who moved the world.” The death of Ismail did not move anyone in Israel. In contrast, the dead Aylan became a worldwide icon, including, of course, Yedioth Ahronoth, which knows what is likely to move Israelis. 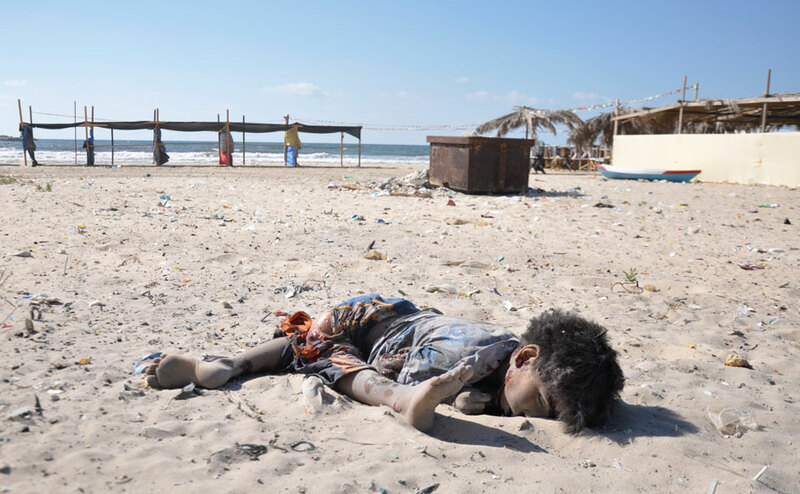 A Palestinian child in Gaza, killed by Israel Air Force pilots’ bombardment together with his three small cousins during Operation Protective Edge, while they were playing soccer on the beach, is not “moving.” A Syrian child of the same age, who drowned while fleeing with his family to Europe is “the toddler who moved” the world. And if this amount of hypocrisy was not enough, we will add only that no one stood trial in Israel for the criminal killing of Ismail (the case was closed). Following Aylan’s death in a criminal accident, a few suspects were arrested in Turkey. Israel has no right to sanctimoniousness over the tragic death of Aylan Kurdi, nor to tsk-tsk at the photograph, nor to feign shock, nor to “offer aid,” and certainly not to preach to Europe. There is a disaster zone that Israel created in its own back yard, an hour and a quarter’s drive from Tel Aviv. In that horrific region, the Al-Amla family told a Swedish journalist who visited their home in Rafah about the enormity of their disaster: They are victims what has become known as “Black Friday” in Rafah, when the Israel Defense Forces went criminally amok in an attempt to retrieve an abducted soldier. The father, Wa’el, lost a leg. His wife, Isra, lost both legs. Their 3-year-old son Sharif, lost a leg and an eye. Wa’el’s brother, his sister-in-law and his 11-year-old sister were killed. They are all victims of the rockets fired at them from Israeli aircraft on that Friday, when they were attempting to flee their homes to their grandmother’s house. Their fate is no less shocking than that of the Kurdi family. The difference is that their tragedy was caused by the IDF. The government and public opinion in Israel should have taken responsibility for this act, should have expressed shock and assisted the family. In refraining from doing so, Israel revealed a level of insensitivity so great that it cannot now react with consternation over other tragedies without exposing its own hypocrisy and double standard. That hypocrisy is also seen in the shock at the fate of the refugees converging on Europe. A country that torments tens of thousands of asylum-seekers has no right to criticize Europe for its attitude toward refugees. If Israel had wanted to make a small contribution to the struggle of the world’s refugees, it should have taken in the handful of asylum-seekers it already has, allowed them to work and live in dignity and opened a gradual track to citizenship for them. Those who are shocked at Hungarian Prime Minister Victor Orban’s statement that the stream of refugees threatens “the Christian roots of Europe,” have to explain what the difference is between concern over the “Christian roots” of Europe, which sounds very bad in Hungarian, and concern for the “Jewish character” of Israel, which sounds excellent in Hebrew. Only one source of homegrown pride is absolutely justified in all this: Hungary and Bulgaria want to learn from Israel how to build a border fence, and in Israel they’re proud of this, of course. Are we or are we not a light unto the gentiles? This entry was posted on 09/06/2015, 9:34 and is filed under Uncategorized. You can follow any responses to this entry through RSS 2.0. You can skip to the end and leave a response. Pinging is currently not allowed. lasilencia’s question “Why are Israelis so moved by the image of a dead Syrian refugee, but oblivious to the plight of a slain Palestinian child?” is worth pondering. 1. The motivating factor in massively publishing worldwide “the image of a dead Syrian refugee” is the opportunity to make enemies look bad (lacking compassion, selfish). It is doubtful that genuine compassion for any Syrian, alive or dead, was involved in this exercise except as a means of intensifying the shame felt by the targeted enemies. 2. The motivating factor in minimally publishing anywhere “the plight of a slain Palestinian child” is because it would make Israel and Organized World Jewry look bad (deliberate cruelty, lacking compassion, selfish). 3. I suspect the mainstream media play their enemies (ordinary people everywhere) like a matador plays a bull. The matador entices the bull to focus on the cape. The mainstream media entices ordinary people everywhere to focus on perennial Jewish victimhood and the right of Jews to defend themselves. 4. Even the dissenting media falls for a variation of the same trick. The major focus needs to be on the crime – not the ethnicity of the criminal. I’m not suggesting the ethnicity of the criminal should be ignored, but the primary focus needs to be establishing the fact that a crime has been committed. Look at the behaviour of gentile leaders when confronted with “The Jews did this …”. They all parrot the line “Israel has a right to self defence”. No: gentile leaders need to be confronted with specific details of a crime leading to a demand for said leader to seriously address the crime. 5. Another reason to focus on the crime is that gentile leaders also commit similar crimes and have a long history of doing so. Heat needs to be applied to gentile leaders to address crimes against humanity. Just think about the crimes against humanity committed by gentile leaders since 9/11. If ordinary gentiles want to stop Organized Jewry’s crimes against humanity, we need to solve the problem of the extreme corruption of our gentile leaders. I think we not only mindlessly focus on the matador’s cape, we also mindlessly keep putting the cart before the horse. Sorry about the metaphors, but hopefully the message is clear enough. I agree with all of you but the people of the world still do not get it. The Jewish controlled news media is very prompt to instill hatred against the Muslims, they are blaming the Arabs for all these wars. I have asked people on the street what they think about all this chaos?. The general answer is that the “Arabs are Terrorists” and they do not know more about it. When I ask them what they know about the Jews? they always say that they are very rich and greedy but no knowledge beyond this point.